The mixed function oxidase (MFO) activity and content was studied in the liver of common brushtail possums fed for 10 days on a diet containing a mixture of terpenes found in Eucalyptus leaves on which possums commonly browse. The MFOs were compared to the MFOs in possums fed a control diet of fruits and cereals only. The terpenes chosen were 1,8-cineole, p-cymene, á-pinene and limonene. The selected terpenes caused induction of P450 enzymes, as shown by a 53% higher cytochrome P450 content and a 45% increase in aminopyrine demethylase activity in the test animals. Aniline hydroxylase activity was significantly increased, with levels of 2.95 and 1.43 nmol min−1 mg−1 microsomal protein in the test and control animals, respectively. There was also a significant increase in androstenedione 16á-hydroxylase activity in the test group, 0.85 as compared to 0.50 nmol mg−1 min−1 in the control group. Western blot studies using human CYP2E1 and rat CYP2C11 and CYP2C6 antibodies gave CYP2E, CYP2C11 and CYP2C6 immunoreactive bands of greater intensity in the test animals as compared to the control group. This study has shown experimentally that dietary terpenes cause enzyme induction in folivorous marsupials. 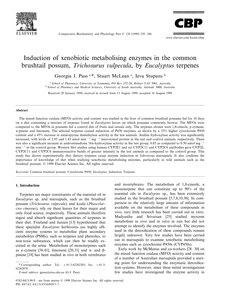 It also confirms the importance of knowledge of diet when studying xenobiotic metabolising enzymes, particularly in wild animals such as the brushtail possum.